Marking the 70th anniversary of VE on 8 May 1945, this short series is looking at British chess between 1939 and 1945 in World War 2, concerning itself with chess on the Home Front. The previous episode started with the early war years at local level, and in this one we move on to look at how organised chess and the armed forces intertwined as the war drew on. Your blogger treads rather nervously as the events, and personalities, are within the living memory of some, and close to the hearts of many. "The 1939/45 war years saw very little organised chess; most of the activity was run by the Unions and County organisations. 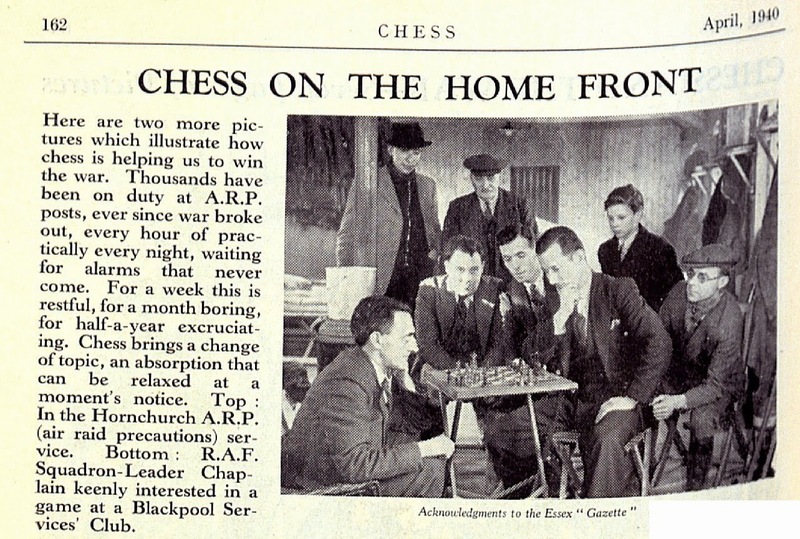 The British Chess Federation was able to support chess in the armed services: it helped the Army Sports Fund and organised matches between the British Forces and Allied Forces in 1941/42, results being 6½-5½ and 6-7 respectively. In 1943 a British Army Championship was held (winner Capt R.H.Newman) and in 1944 an R.A.F Championship (won by F/O E.Brown). The County and District Correspondence Championship and BCF Problem/Composing Tourneys were maintained during these years." This post will put some meat on several of those bones in relation to chess in the armed forces. In August 1940 the BCM reported Mr A.C.Venieux's "laudable scheme" (note: Mr Venieux's scheme, not the BCF's - he was a senior figure in Herts County chess) for "spreading the game far and wide among the Forces". The plan that "the Southern Counties Chess Union should 'adopt' the Navy, and the other regional chess unions devote themselves to the Army and RAF". There was even a preliminary list of requisites: the Navy wanted peg-in boards; the Army wanted local clubs to make contact; the RAF asked that boards and sets be notified to the RAF Comforts Committee, 20, Berkeley Square, London W1. By September Mr Owen Dixon, Secretary of the Southern Counties Chess Union, was able to report that the following impressive list of material had been despatched to the Navy: 34 peg-in sets, 305 pocket sets, 258 chess books, 2 wooden sets, 94 copies of the BCM, and 200 of Chess (whatever that says about the relative popularity of the two magazines). In his 1960s autobiography My Way With Polio he gives the grand total of sets, boards and books donated by the SCCU as 2,145 (1,482 Navy, 624 RAF, 39 to the Army). In July 1941 the Secretary of the Scottish Chess Association had "undertaken all arrangements in connection with the 'Chess in H.M. Forces' scheme in Scotland...which augurs well for its success". Indeed, in December 41 there is a report of a match between "Glasgow CC and the Army units stationed in the District" - though, perhaps tactfully, no result is given, and no connection is made with the next item: that (still in Scotland) "last month Mr. Fairhurst gave an instructive and entertaining lecture to a good audience of Service players, the first of a series of "Forces" evenings . Other clubs please copy!" William Fairhurst was British Champion in 1937 and many times Scottish Champion. So Service chess was getting organised. Here are some reports: from BCM November 41, Seaford CC played the King's Regiment - drawn 4.5 a piece, in what was the King's second match; May '42, Manchester 'A' played the Royal Army Pay Corps; and, in the same issue, the RAPC and RAOC both compete in the Leicester War-time Chess League (which apart from what it says about Chess in the Army, says something too about chess activity still continuing on civvy street). Out to the west of London, in the large military encampment at Aldershot, a Forces Chess Club was formed - meeting every Wednesday, but the "main difficulty is, as usual, provision of boards and men". Incidentally, the BCF offered to be a clearing house for "locked up and idle" equipment of inactive clubs, directing it to the "many enthusiasts lacking material" (BCM Nov 1941). In November 1942 Aldershot Forces CC was confident enough to take on a re-formed Croydon CC, but the match "had been unavoidably postponed on account of service exigencies." There you have then, as might be expected, an echo of the role of chess in WW1, as we recorded in the earlier War Game episodes: it was something to do to relax, or fill in the longueurs. "A.C. Bloom, one of the foremost players of Hampstead CC training to be a pilot...for sometime at an RAF station in Scotland...such enthusiasm for the game...the keenest players among the beginners are the RAF Special Police, who find chess a wonderful relief in their long and monotonous hours of duty". Same elsewhere: "Ilford Fire Services have taken up chess and their example might well be followed by all anti-aircraft services, both civil and military. Of necessity they have much more time to kill than other units" (all from BCM May 1942). Chess back in April 1940 had already seen the niche opportunity - though that was still in the "Phoney War" period. The editorial in the BCM of January 1942 summed up the developments of chess for the Forces. "The Review of the Year would be incomplete without referring to the new and intense interest taken in chess by the naval and military authorities. With their approval, encouragement and practical help, a number of clubs have been formed in various units, important matches have been played and arrangements made by which such units can be supplied with chessmen and boards... The chess community and the clubs have but partially responded to the call, but whatever assistance was forthcoming, it was of the most enthusiastic kind." The "important matches" between the services were, evidently, no small feat of organisation - this was wartime, and the players were on active duty. BCM in November 1941 reported the difficulties with "the first important match under the 'Forces Scheme' ": Army v RAF. Neither the House of Commons ("as originally intended") nor a central London Club proved possible, so Hampstead CC stepped into the breach, although Board 1 was to be played in Belfast as both R.C. Noel-Johnson (RAF, and Kent champion and county player - their 1st board v Surrey 21 Jan 1939, for example) and Harry Golombek (Army, and ex-Surrey CCA) were stationed in Northern Ireland; except that their game was cancelled when Noel-Johnson was "called away to a special course". The full match was reported in December's BCM: 4.5 v 3.5 to the Army (Parr 0 v 1 Solomon on board 1). "Among the visitors was Mrs. Menchik-Stevenson, the woman champion." Over the eight boards there was only one draw, and the BCM commented in these morale-boosting terms: "The 'will-to-win' is not one of the strong points of British chess and it is doubly welcome in a member of the Fighting Forces." A "Special Correspondent" in the Yorkshire Post and Leeds Mercury of Monday 17 November 1941 helped introduce the Polish players. Lt Sulik (Bd 2) "played regularly in the Polish International team", and Lieutenant O Balcar (Bd 4) was interned when the Germans invaded Poland, but with "some money from the Polish Government [he] was able to buy a suit of civilian clothes and escape..got to Greece...from there to France, so that could continue to fight...was driven back...got to a village near St. Nazaire...British warships were waiting off the coast...here [he is] in England". "In 1941 I was stationed in an artillery unit in Northern Ireland, and my service there was relieved by a week-end trip to Nottingham where I was due to play on top board for the British against the Allied Forces. I anticipated an easy victory, as my opponent was an unknown Lieutenant Cartier of the Free French Army. I had the delightful disappointment of discovering that le lieutenant Cartier was no less a person than my old friend Dr Tartakover. When France fell, he made his way to England via Oran and a British battleship; and there he was, looking just as quizzical as ever, incongruously attired in British battle dress. Though he was now approaching his middle fifties, he was as gallant and determined as ever in his fight for what he believed to be right." Here are the two protagonists a few years later. The "Cartier" v Golombek game, and the BCM notes were reproduced in Chess History 5140, and may be played through here. It is an undemonstrative piece of class by Tartakover. Instead let's remember Private Victor Farkas one time champion of Bratislava on board 5 for the Allied Forces. Here is one he played earlier "in a match against Leamington Spa...a gem of the first water" (BCM Nov 41, but was earlier reported by the Leamington Spa Courier 6 Dec 1940). By contrast with the Tartakover game it is a flash of opportunistic brilliance against a weaker opponent. Sadly, later, in 1943, the BCM reported that Victor Farkas "beloved member of the Czech Army" was "killed instantaneously by an accidental explosion while clearing mines off the British coast." The BCF "gave credit to Mr J du Mont for his work organising" the match, said the Hastings Observer (27 Dec 1941). In fact it was "a triumph for Mr Du Mont" said the Yorkshire Post (17 Nov 1941), which also reported that the War Office had provided rail vouchers for all the players. "Despite their all-night journey [from Scotland] the Poles were in a jovial mood, and brought a portable gramophone with them and a record of Polish songs". The BCM noted that Alderman J.D.Derbyshire and the BCF "generously entertained" the teams, and that R.H.S.Stevenson "had charge of the match" (that's BCF President and Hon Sec., respectively). But whatever the success of the match "there will be a lull in these functions, which involve a considerable amount of travelling" said the BCM. In fact, there was a return contest (another tribute to Mr. du Mont's drive said Chess in December 42), in Leicester in November 1942 - 7 v 6 to the visitors (when Lt.I. Mongomerie - Herts Champion before the war - lost to "Cartier" on bd 1) . These matches illustrate the country's place in the war as a relatively safe haven for combatants displaced by the Nazi invasion of so many European countries. Czech and Polish players later met in a three board match, and a team tournament was planned "between the Royal Netherlands Brigade, the Czechoslovakian Army, the Polish Air Force and the local command." By January 1943 a Norwegian Forces contingent had formed a club in London, meeting in Kensington. There were also to be matches involving the US Air Force - though admittedly they weren't refugees (e.g. v Norwich CC, losing 2 v 4. Chess September 1944). There are other examples of matches played by Forces teams e.g. Allied Forces v Congress in Sidcup (BCM Nov 1942) and v Lud Eagle as late as 1944, with a good number of British Forces personnel to swell the former's ranks (Ch Sep 44). 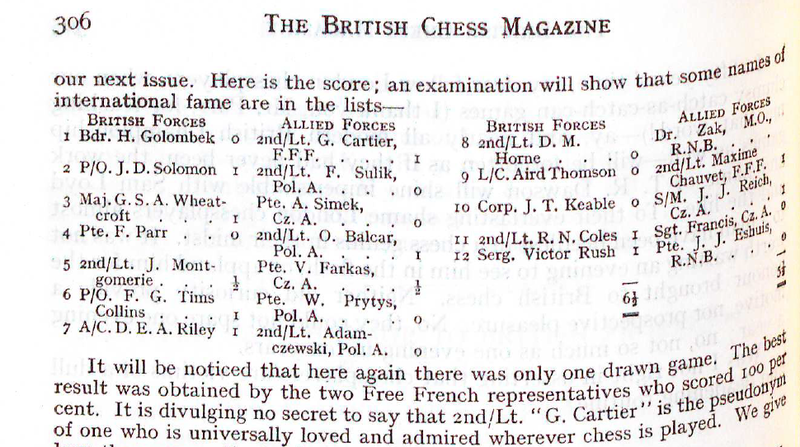 The Service Championships, as noted in the ECF history note, were the other prominent aspect of Forces chess. The Army Championship was organised with regional "zonals" followed by "the climax to months of painstaking organisation, with endless reverses [which] came in a full-scale tournament at the Bonnington Hotel, Southampton Row, London on August 18th - 24th 1943" (Ch Sept 43). The winner was Captain R.H.Newman of Northern Ireland Command - who, assuming this to be the same R.H.Newman, had form, and would beat Tolush in the Anglo-Soviet match of 1947. He was a Surrey County top-board and, Ladies and Gentlemen, a pre-war member of Brixton Chess Club. The RAF championship in early 1944 was an invitation tournament won by F/O E. Brown, who won "an exquisite carved ivory set presented to the RAF by the Army", the trophy - a "fine presentation board" - however, was given by the BCF (details from Chess April 44). 2nd was Francis Kitto, well known in west country chess circles. A Navy Championship seemed a bridge too far. Here are a couple of short, combative games from these Forces championships, as given by Chess. The full notes to the first were by Vera Menchik, and will do wonders for your understanding of the main line QGD, in case you should ever find yourself wandering down those neglected paths. The loser A.N. Booth, himself clearly familiar with the opening, had (I notice) played in the NCC's championship preliminaries in May 1940, finishing 3rd in Section B behind Golombek and E. Brown (who won RAF championship above and had been a pre-war Middlesex County player). Kitto, 2nd above, was on board 2 for Cambridgeshire (v Surrey) 6 May 1939, when Golombek beat Milner-Barry on bd 1. It looks like many of them had form, including Bloom (5th in the RAF Championship) who might be the same Hampstead chap spotted earlier in this post up in Scotland, then teaching the RAF Special Police how to play. This game from the RAF championship was introduced in Chess April 1944 thus: "In the following game White [who finished third - MS] takes full advantage of the weak continuation 7...P-KKt3. The game is finally decided by a very attractive combination." The tradition of Forces chess continues today as the Combined Services Chess Championship. The next episode will look at the controversy over the role of the British Chess Federation in the war. Thanks again to Chess and the BCM. Owen Dixson My Way With Polio (nd, but probably early 60s) Pub Merritt & Hatcher Ltd.
More episodes: War Game 4; War Game 6; War Game 7. Several of the players mentioned had connections with chess in Richmond & Twickenham. Books published by Bibiogora – David Rex-Taylor, controversial bridge player who lived in Whitton (I knew him well when I was playing bridge in the late 60s/early 70s). Played Yehudi Menuhin on a train in 1944 (game in T(EM)CCA). Scottish Champion in 1951. Mother was Scottish Ladies Champion 6 times between 1929 and 1937. Played for Richmond/R&TCC until his death. Member I think of Twickenham Chess Club and maybe later R&TCC but had stopped playing before I joined. I’ve seen an address for him somewhere – possibly in Hounslow? More information would be welcome. Author of Gambits Accepted and an unpublished book on McDonnell-Labourdonnais (I have a copy). Lived in Kew I think. Two chess playing daughters, Lesley (married Robert Pinner of R&TCC) and Antoinette (allegedly had a relationship with a well-known chess player/journalist). Harry Golombek was at one point President of R&TCC. FW Allen may have been the Fred Allen who was a member of R&TCC for a short time round about 1970. Didn't one of your books mention Farkas? Not T(EM)CCA. He might possibly have been mentioned in Addicts' Corner at some point. Another interesting source for the period, by the way, is the West London Chess Club War Time Gazette, which I have in front of me at the moment. Must be a rare copy of an exceptional example of club war-time effort. How many issues were there/have you got? Not in the British Library, as far as I can see. Thank for the offer to view. Martin Cath has been in touch to add some further information to that given by Richard above. I'm quoting Martin (who btw has catalogued details of all Surrey players over the years) but in the order adopted by Richard. "Dr John D. Solomon was with Sheen for 1948-49, and then he was one of Battersea's top players from 1949-1959. I only have a reference to his being a member of Richmond in 1984. My records show J. Hobbs as a Battersea player from 1935 to 1938 and resurfaced in 1962-65 playing for Epsom. He played County chess from 1935 to 1970 and won the Slater-Kennington cup in 1936. Leslie Fletcher was the originator, and first editor, of the Surrey Chess News. On L.C. Birch [see War Game 7]: I am surprised that the reference to [his] death is shown [in the blog] as Chess as I thought his death was reported by the BCM a year earlier, and that surely was when the war in North Africa was taking place...He was a frequent contributor and correspondent with the BCM." Thanks Martin for your info.